Sebastian Vettel has won the British Grand Prix at Silverstone, retaking the lead 5 laps from the end. An eventful race saw Hamilton in last position after the first lap, and two safety cars making for a tense end of the race. Lewis Hamilton recovered to finish second, ahead of Kimi Raikkonen. When the lights went out, Vettel made the better start and immediately charged into the race lead. Hamilton soon realised the thread and defended his position for more people coming from behind, but Bottas still made it through. Raikkonen want side by side with Hamilton through the first few corners, until they touched, sending the Mercedes driver into a spin that would drop him to 18th, in between both Williams. Raikkonen fell back behind both Red Bulls. He quickly got past Ricciardo again, but became stuck behind Verstappen. On top of that, it was announced the Ferrari driver got a 10s time penalty for causing what seemed to be a perfectly normal racing incident. Amidst avoid cars, Nico Hulkenberg moved up from 11th to 6th. Leclerc, Ocon and Alonso gained two positions, but Sainz gained 6 places, into 9th. The big losers were Magnussen who dropped 3 places and Perez, who fell back to last due to spinning on lap 1 as well. Brendon Hartley was even worse off, as he rolled into the pits at the end of the first lap to retire from the race. On lap 11, Hamilton passed Hulkenberg to take 6th position, 13s down on Ricciardo. Meanwhile, Raikkonen complained about understeer, adamant that his front wing was damaged. 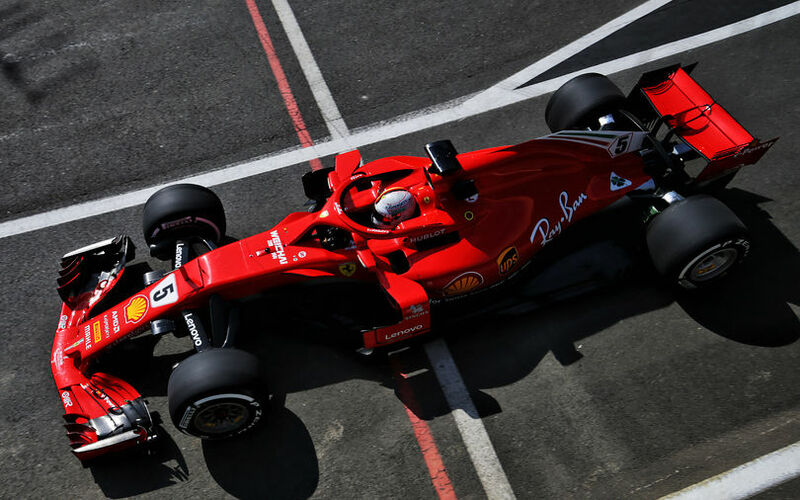 Images though showed there was little to no damage at all, causing an even more angry Raikkonen when on lap 13 he pitted, got medium tyres and didn't get a nose change. The Finn returned to the track in 9th position and quickly went past Ocon after setting the fastest lap of the race thus far. On lap 17, Verstappen pitted and rejoined 7s ahead of Raikkonen, who continued to go round quickly. He would have easily gotten ahead of Verstappen, if it was not for that 10s time penalty that he served during his pitstop. Ricciardo pitted another lap laterand got back on track just 2s ahead of Raikkonen. For Charles Leclerc, a string of successful weekends came to an end as a tyre didn't get fixed properly during his stop, requiring the Sauber driver to retire the car a few corners later. Vettel then pitted on lap 20, followed by Bottas on lap 21. This briefly put Hamilton in second position, until he allowed Bottas past, after having asked to not pit just yet. At the time, Hamilton was setting 1:33's, similar to Verstappen, Ricciardo and Raikkonen, but a second slower then Vettel and Bottas on new mediums. Hamilton then pitted on lap 25, returning to the track again in 6th, 11s down on Raikkonen. He soon got on with it and was a lot quicker than Raikkonen. By lap 31, the difference had reduced to 5.3 seconds. Meanwhile, Red Bull pitted Ricciardo again, changing back to new soft tyres on lap 30. On lap 32, Ericsson crashes off and end up in the tyre barriers at high speed. He still had his DRS open while entering Copse, which is apparently a bad idea with not-so-fresh tyres. Though no debris was left out on track, and the run-off is large, the safety car was brought out. The pitstops that followed saw Verstappen and both Ferraris switch to softs, just like both McLarens, Sainz, Gasly and Perez. As neither Mercedes stopped, and opted to continue on the medium tyres, Bottas inherited the lead, followed by Vettel, Hamilton, Verstappen, Raikkonen, Ricciardo, Hulkenberg, Ocon, Magnussen and Alonso. On lap 37, the race was on again, with Raikkonen notably very challenging towards Verstappen. The Finn briefly managed to get past, but the Dutchman returned the favour and took fourth place back just one corner down the road. Meanwhile, Sainz tried to get past Grosjean round the outside at Copse, but both collided and ended up in the barriers, requiring another safety car for 4 laps. On lap 42, the race was on again, with no position changes at all. Raikkonen was too far to challenge immediately, but two laps later he got 4th as Verstappen went through the grass on the exit of Chapel. The Finn showed impressive pace and soon positions to attack Hamilton just like Vettel was doing versus Bottas. Verstappen error meanwhile dropped him down 2s on the Finnish Ferrari driver, only just keeping Ricciardo behind him. Two laps later, Verstappen makes another mistake, possibly triggered by a technical issue, and ends up backwards into the grass. He rejoined the track down in 14th before retiring half a lap later. At around the same time, Vettel managed to get past Bottas at the end of the Wellington straight, and immediately set off to take the fastest lap. Bottas was soon attacked by Hamilton, and passed subsequently in what didn't really appear to be a fight. Another lap later, Bottas lost third to Raikkonen and soon had Ricciardo in his mirrors. That threat didn't materialise thanks to the Mercedes essentially being the better car, so positions were fixed till the end. The only man to gain a position after this was Alonso who managed to get Magnussen for 8th place.